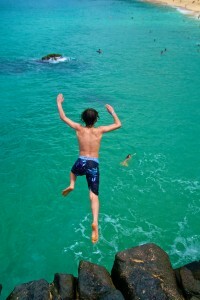 A boy cliff dives off a rock outcrop in this online jigsaw puzzle. The diving point is at Waimea Bay on Hawaii’s North Shore. Credit: Special thanks to Zach Dischner for making the photograph used for this jigsaw puzzle available through the Creative Commons Attribution license. Visit Zach Dischner's Flickr photostream. See all jigsaw puzzles based on Zach Dischner's photographs.